I enjoy the challenge of drawing buildings. It's fun, but if you get the perspective lines wrong, it's clearly wonky. 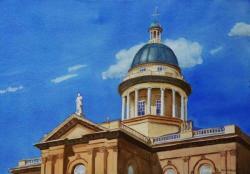 I've included in this section paintings where the building or buildings are the main focus. Under landscapes you'll see some buildings and bridges that are incidental to the landscape. This Queen Anne house was built in 1882 by Joseph and Louis Atkinson. The house is on the National Register of Historic Places in Napa County, and is located at 8440 St. Helena Hwy. in Rutherford, California, on the grounds of St. Supery Vineyards and Winery. My son Dan works in offices on the second floor of the tower. Watercolor, 20" x 14". Another watercolor of a fascinating and beautiful building -- what I think is perhaps the most beautiful public building in California. 10.5" x 11"
This was adapted from several historical photos in Images of America - Loomis, by the Loomis Basin Historical Society (Arcadia Publishing, 2009). This shed no longer exists, but it was once at Taylor Rd. and Webb. Watercolor, 20x14 inches. 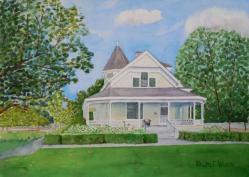 Exhibited in "Along the Lincoln Highway," A juried art show by the Auburn Arts Commission, Dec 12, 2013 to Feb 7, 2014. 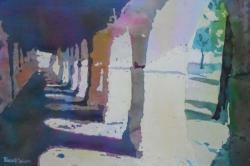 Watercolor: Colonnade at San Juan Bautista Mission - 21" x 14"
A trip down US 101 to Santa Barbara several years ago inspired this painting of the colonnade at San Juan Bautista Mission near Hollister. I used a pouring technique, successively masking the lighter areas, and then pouring primary colors -- thalo blue, quinacridone red, and new gamboge yellow. This painting was voted "Watercolor of the Month" at the WASH Watercolor Club, Sacramento Fine Arts Center, for April 2017. Watercolor, 21" x 14". 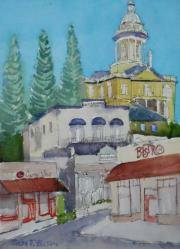 Watercolor: Commercial St., Old Town, Auburn, CA - 14.5" x10.5"
This was painted plein air on an overcast October Saturday morning. About 11:15 am I got rained out and finished at home. These are brick buildings built in the 1880s, with the Placer County Courthouse towering in the background. Watercolor, 14.5" x 10.5". Here's a view just down the street from my hotel in Delft, Netherlands, in mid-September 2014. 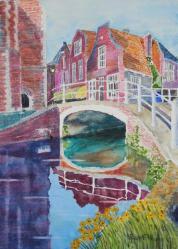 The shops are just over the canal bridge across from Oude Kerk (Old Church), founded in 1246 AD. Of course, Nieuwe Kerk on the other side of town was founded in 1584. I found Delft to be a charming city, much slower-paced than Amsterdam. Watercolor and watercolor crayon, 14 x 20 inches. 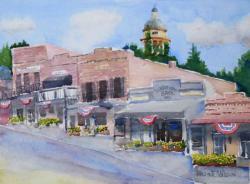 Watercolor: Old Town Auburn - 8" x 10.5"
On Saturday morning, Feb 11, 2017, Placer Art League sponsored a "sketch crawl" in old town Auburn. 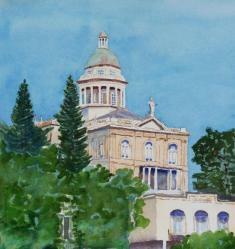 Here's my two-hour plein air product, with the Placer Co. Courthouse at the top of the picture. I think it is perhaps the most beautiful building in California. This is my fourth attempt to paint it. Watercolor, 8" x 10.5". 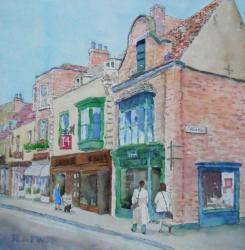 Watercolor: Shopping in Lincoln, England - 14.5" x 14.5"
The old streets and quaint shops of Lincoln, England, are charming. 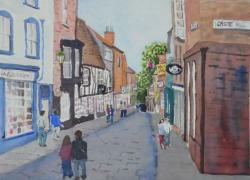 This painting includes my wife Jean and her sister Connie shopping there during a trip to England in July 2009. 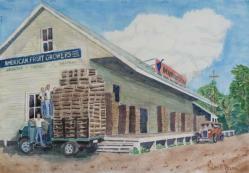 For this painting, I began with a pen-and-ink sketch and then used watercolor to finish. This won the "Painting of the Month" for October 2017 at WASH, the watercolor club at the Sacramento Fine Arts Center. Watercolor and ink, 14.5" x 14.5". 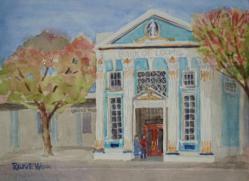 Watercolor: State Theater, Marysville - 10.5" x 14.5"
This old theater opened as the National Theater in 1927 in Marysville, CA. Its baroque decoration is striking. Watercolor, 10.5" x 14.5". Watercolor: Amsterdam Street View - 10.5" x 14.5"
During my trip to Kenya and Amsterdam in September 2014 I caught this busy street scene. I had just seen a demo by watercolorist Qian Gao who greatly simplifies complex scenes. Here's my first attempt, though I have a lot more simplification to go! 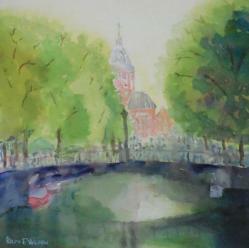 Watercolor, 10.5" x 14.5"
Watercolor: Canal to the Basilica of St. Nicholas, Amsterdam - 14.5" x 14.5"
I tried to simplify this scene, with the tranquility of a canal that ended at the Basicilia St. Nicholas (1887) in the distance along old town canal. It started as a 14x20, but a square format worked better. 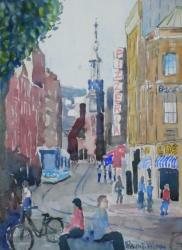 Watercolor: Street Scene, Lincoln England, 14.5" x 10.5"
The shops along this Lincoln Street are picturesque. Here the street is going downhill some. Another attempt at simplification. Watercolor, 14.5" x 10.5"
Watercolor: Dawn at the Auburn Courthouse - 20" x 14"
I love the light and color that shone their way into this painting of the gorgeous Placer County Courthouse in Auburn, CA at dawn. This building is certainly my candidate for the most beautiful public building in the State of California. This is my fifth attempt at painting it. This painting is exhibited in the juried 2017 WASH "Go with the Flow" Open Show, Sep 6-Oct 1, 2017 at Sacramento Fine Arts Center. Watercolor, 20" x 14". 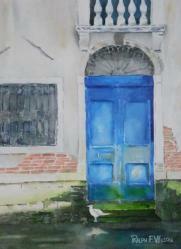 Watercolor: Blue Door, Grand Canal, Venice - 10.5" x 14.5"
My son David took a striking photo of a weather-beaten blue door on the Grand Canal in Venice in June 2015, from which I made this painting. Earlier photos I found on the Internet of this popular door show that it once had a lamp hanging over it, and posts to which to tie up one's gondola. The sea is hard on sinking Venice. Watercolor, 10.5" x 14.5". June 2017. Watercolor: Peeking at Lincoln Cathedral - 11.25" x 21.5"
During a 2009 trip to England, Jean and I spent time exploring Lincoln Cathedral. It was begun in 1088 AD and built over the next several centuries. 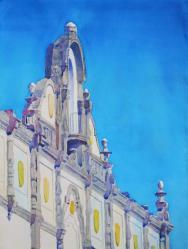 This painting is of a view of the building's flying buttresses. The more I worked on this painting, the more I grew to appreciate the level after level of intricate decoration of even the slice I was painting. It's amazing! Victorian writer John Ruskin declared: "I have always held... that the cathedral of Lincoln is out and out the most precious piece of architecture in the British Isles and roughly speaking worth any two other cathedrals we have." 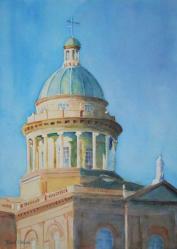 Exhibited in the in the "Awash with Color" WASH Members Show at Sacramento Fine Arts Center, April 3-22, 2018. 171031. Watercolor, 11.25" x 21.5". 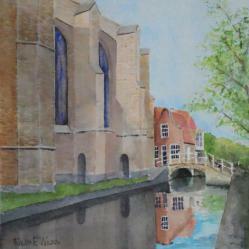 Watercolor: Shops in the Shadow of Oude Kerk (Old Church), Delft - 14" x 14"
In mid-September 2014 I visited Delft, Netherlands on my way back from Kenya. Across the canal from my hotel was Oude Kerk (Old Church), founded in 1246 AD. Of course, Nieuwe Kerk on the other side of town was founded in 1584. This is a scene down the canal at the bridge and shops beyond the church. This painting was juried in to the WASH Open "Go with the Flow" watercolor show at Sacramento Fine Arts, September 4-30, 2018. 171116. Watercolor, 14" x 14". 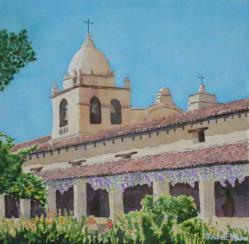 Watercolor: Carmel Mission and Colonnade - 14" x 14"
Instead of the familiar view of the Carmel Mission near the entrance, this view from the school courtyard views the outline of the bell tower above the colonnade. Since Jean and I visited on our anniversary in early February, I needed to imagine the garden in full bloom. 180517. Watercolor, 14" x 14". 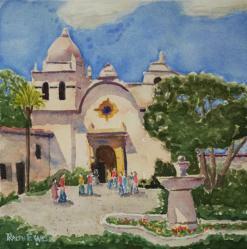 Watercolor: Carmel Mission, 10" x 10"
Here's a view of Carmel Mission from the courtyard in front of the doors. Certainly one of the most beautiful of the California Missions, Carmel was founded by Father Junipero Serra in 1770, this building being completed in 1797. Father Serra is buried here. 181018. Watercolor, 10" x 10". Watercolor: Bank of Loomis - 12" x 9"
I sketched this painting on-site, and after beginning to paint, three-and-a-half hours had passed. I came home to have lunch and finish. The Loomis Bank Building was built in 1918, so it is 100 years old this year. It was built in a Neo-Classical style, and is doubtless the grandest old building in Loomis. It has been occupied by several banks since then, then the Placer County Water Agency, and in 2010 the Town of Loomis. The rather gaudy blue, aqua, and yellow paint wasn't original, but accentuates the numerous architectural details. 181025. Watercolor, 12" x 9". Watercolor: Oldtime Sutter Creek, CA - 14" x 14"
Jean and I visited Sutter Creek, CA for our anniversary in February 2015. 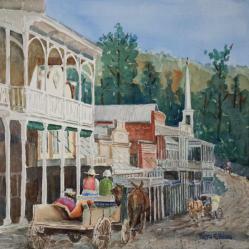 The town is one of the jewels of the Gold Rush towns strong along Hwy 49. Here's a view looking south along Main Street (Old Hwy 49), with the Methodist church in the background. The building was built in 1862, but the steeple wasn't added until 1976. The cars parked along the street didn't look like, so I took artistic license to replace them with a couple of wagons -- but I kept the steeple. 181011. Watercolor,14" x 14". 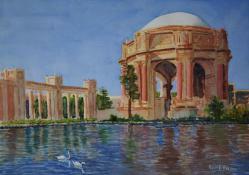 In January 2014, Jean and I stopped by the beautiful Palace of Fine Arts in a trip to the city. It built for the 1915 Panama-Pacific Exposition and rebuilt in 1965. It has a gorgeous reflecting pool, to which I added a couple of swans that were swimming in another section. (They didn't mind.) I tried to make a photo taken on a dull day bright and full of color. But the colors seems to clash a bit. 181115. Watercolor, 20" x 14".